As e-books thrive in the Russian regions, RBTH takes a closer look at how digital formats are helping libraries increase access to literature. Across the world, paper is losing popularity as readers begin to prefer e-books. 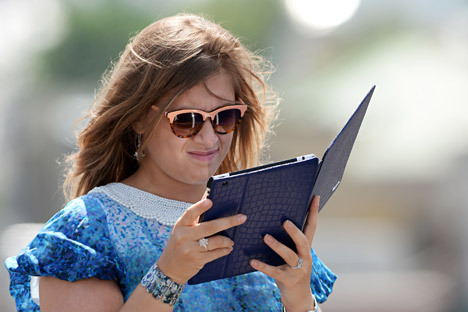 A recent VTsIOM poll found that Russians are joining this global trend, as enthusiasm for e-books has risen from 9 percent of readers in 2011 to 17 percent, while only 47 percent of readers use paperback books compared with 62 percent four years ago. But what are the consequences for libraries in Russia? The same poll suggests that libraries have been losing their visitors. About 63 percent of respondents hadn't visited a library for two years, and noted libraries would be more inviting if they provided access to e-books or reading rooms equipped with networked computers. In Moscow and St. Petersburg, however, these changes are already taking place. As libraries become more modern, readers are provided with opportunities to download books online, while events dedicated to reading and literature help to capture people's interest and make reading a part of their daily routine. In the past, the situation was less optimistic in the regions. However, during the Year of Literature, several interesting projects are being developed to promote reading. RBTH has picked examples of regional activities that help to make access to books as easy as possible. Several bus stops in Samara have been equipped with so-called virtual bookshelves. Now any city resident can download a book and read it on the tablet or smartphone while waiting for a bus. The collection consists of children's books, classical literature, detective fiction, poetry, books in foreign languages and pieces by modern authors. Readers can download books to smartphones or tablets, simply by pointing the device's camera at the spine of the book and scanning a QR-code. The feature is available to users of iOS, Android and Windows operating systems with access to the Internet. The Fyodor Dostoyevsky Central Library in Nizhny Novgorod has started a program of modernization by purchasing 10,000 RFID-tags to identify books and installing three librarians’ universal workstations. Now a computer program can subscribe a reader and indicate the period of books’ issue in a matter of seconds, analyzing a pile of five to seven tagged books placed on a special pad. Tags are also used with special mobile terminals to conduct inventories. One terminal can make an inventory of 50,000 books per day, leaving librarians free to conduct leisure activities for visitors such as competitions or meetings with writers and artists. The program of modernizing libraries in the city will continue. There is a plan to have upgraded around 10 libraries in Nizhny Novgorod by 2022. The Nikolai Dobrolyubov Regional Library in Arkhangelsk has taken its first steps into digitization by implementing RFID coding technology. This has resulted in the launch of automated processing, where readers themselves are able to formalize the borrowing and return of books without the involvement of librarians. Visitors have immediately noted positive changes in service such as reduced processing time and the capacity to track books' status online. This promising technology also ensures the safety of library funds, simplifying its inventory and the collection of statistics on usage. Citizens in Cheboksary were surprised and delighted when an online open-air library appeared. Located in one of the city squares, it was a booth with books that could be downloaded via QR-code. It represented 200 electronic products, including a unique collection of publications devoted to World War II, and offered readers a convenient way to explore famous pieces of writing. The project will be developed. In the near future such booths will be set in city parks and the collection of e-books will grow as well. New technologies are even reaching small Russian towns. An innovative socio-educational project has been launched in Ryazhsk, a small city near Ryazan with a population of around 21,700 people. In the Central Library, a virtual bookshelf has been installed alongside the shelves with paper books. Now every visitor has the opportunity to freely download classic Russian and foreign literature to a mobile device, with more than 80 e-books available at the moment. In a world rapidly changing under the influence of innovative technology, libraries across Russia have recognized the need to offer people ways of reading that suit their habits and lifestyle. These projects show the success of using digital formats to recapture the imagination of readers, tempting them away from social networks and video content, and back to the joy of books and fiction.